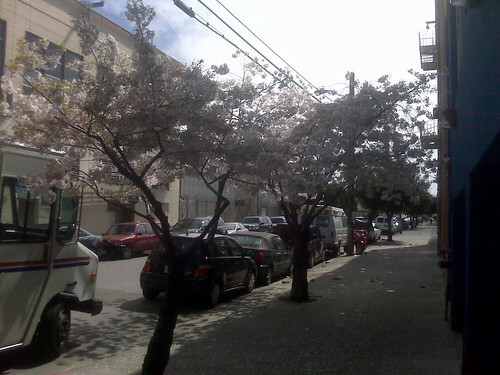 I enjoyed the blossoming trees on the 700 block of Alabama as I made my last drop before lunch. I bought a burrito from a truck around the corner and sat down here to eat it. 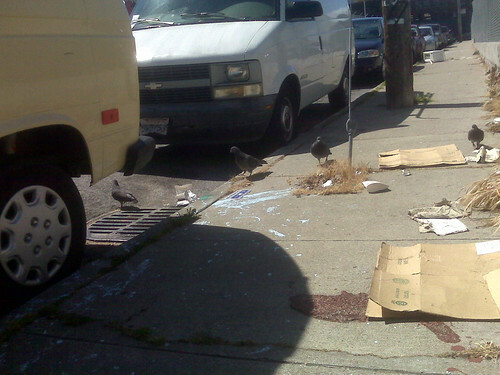 It wasn't long before some pigeons started creepin' on me. Later on I got a front flat because I'd jinxed myself by talking about how I never get flats this morning on the bike shuttle. I could have used a new tube, but I decided to patch it because I wasn't in a hurry and it's more economical. 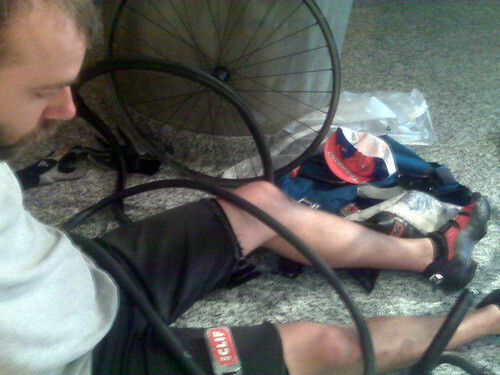 Above is me in the lobby of 51 Federal waiting for the glue to dry. 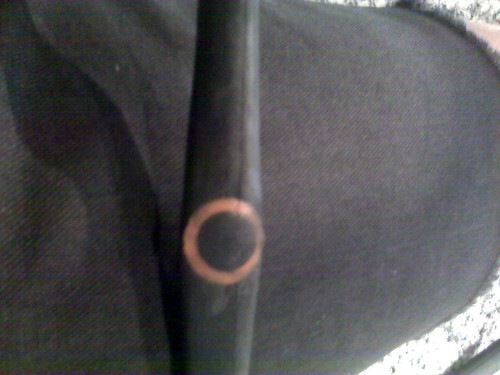 This is what a patched tube looks like. 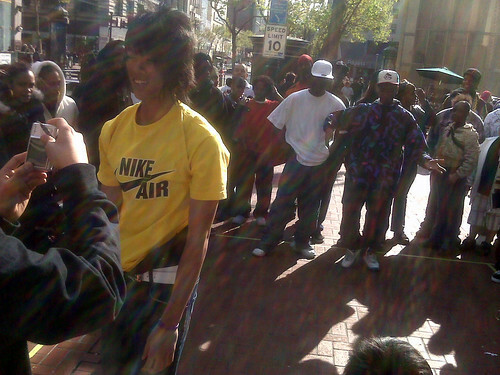 I stopped to watch the break dancers on Market street. 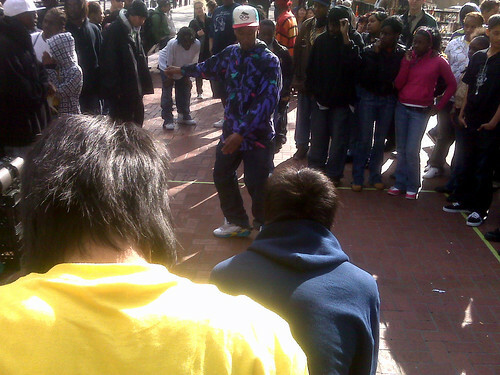 This guy was my favorite and he had the tightest outfit. 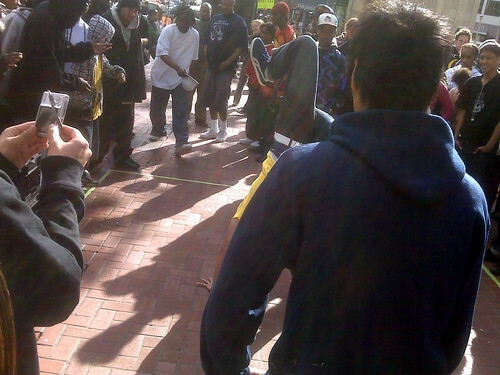 Every time his turn came around, the guy to his right in the background, crouched over in the white t would eventually have to tell him "that's enough, come back, come back" because he apparently was stretching out his turn too long. 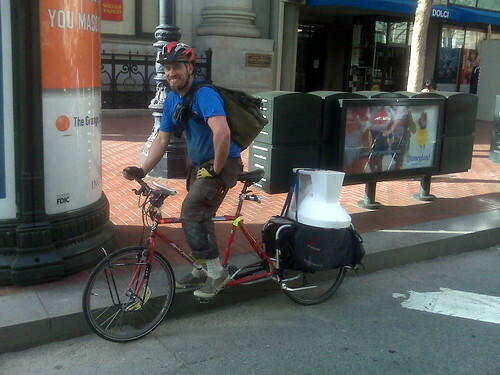 At the end of the day I saw this dude carrying his toilet home with him. A true champion. Very pretty. How many days can you enjoy 桜 in SF? It would be nice if I can see them when I will be there next time! What do the characters mean, if I may ask? Cherry blossoms? what's up anonymous. 花見 is hanami. it means "flower viewing" or usually "cherry blossom viewing".